If you read my review of the Project Nimbus early access in spring of this year, you know that I was hoping for a more polished experience from the final product. 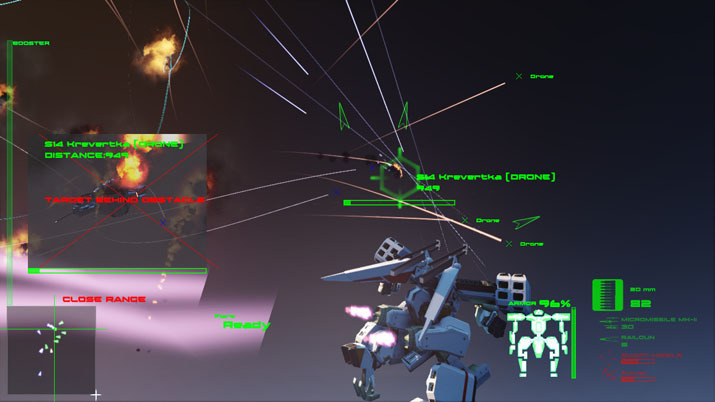 I want to reiterate that this nonstop flying, mech-ace fighter is impressive for such a small team, but while the battles are just as addictive and exciting the second time through, there is very little difference from the Early Access version. I’ll admit I kind of regret giving the early access a mere 6 out of 10, but that’s the cost of asking me to review an unfinished game – there’s just no way to tell how much work will be put into the final product. 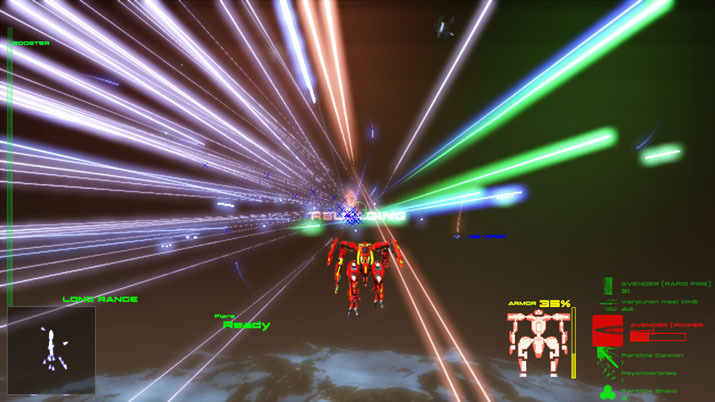 But Project Nimbus is definitely worth a second play. You don’t have to repeat every single mission, since the menu allows you to choose the ones you really like, and this is a great feature. What’s more, the pre-mission story snippets are also optional, so you can take your time with them if you want a more flavorful experience. And since this title plays around with philosophical concepts like war and peace, the connection between humans and machines, and what it means to be loyal and honorable, the story takes on a different tint after you’ve experienced the ending. You play characters on both sides of the war – which has an emphasis on airpower, since the oceans rose after the last world war – and this lends a philosophical tone to everything. As you rocket through half-submerged skyscrapers over what used to be Hong Kong, or under the floating island of New Taipei, you begin to wonder if you aren’t just doomed to repeat the same wars over and over, resorting to larger and larger superweapons to bring temporary peace and lasting environmental destruction. Or, at least the characters wonder. Don’t get me wrong, it’s nothing super profound because these ideas are just thrown around briefly and you are left to fill in the gaps yourself, but it achieves something similar to the brief dialogue of the legendary title that surely inspired it – Ace Combat 5 (the best in its genre, and don’t you forget it). The other reason Project Nimbus has high replay value is because the combat never gets old. The weapons, mechs, and enemies provide a solid combination of tactics, and there just isn’t anything on Earth that beats ultra-fast robot battles. You may find yourself seeking out the most difficult missions, some of which involve two and three stages of epic battles, just because they are so challenging and the payoff so great. This game is at its best when you find yourself in hairballs so thick you can’t ever see yourself getting out, but you somehow pull it off anyway. Or, you don’t. Full disclosure: I have never beat the hardest mission. You can call me a [EN: overpowered] noob if you want, but in the Early Access and this final release I beat my head against the wall trying to do it, and I’ve deemed it impossible. The hardest mission also happens to be the climax of the game, and everything else is just a tying up of loose ends, but playing it in Early Access raises expectations a bit, as you might imagine. After such an intense battle, the final chapters of this title must be truly epic, right? Not really. There is one more chapter consisting of two levels, and they essentially go for quantity instead of quality. One is a level with a huge amount of mostly ground targets, and the other is one large target that is hard to destroy. Then, the credits simply roll. This mopping-up is structurally sound, story-wise, I suppose, but the fact that the climax and character arcs all essentially concluded in Early Access makes the final two levels seem tacked-on. Credit should be given where credit is due, however. There seems to have been a lot of effort put into upgrading the graphics for the final release, and while the writing and voice acting are still full of grammar errors in the beginning missions and the sound levels for said dialogue are hit and miss, these aspects seemed to be noticeably improved in the final chapter. What this all amounts to is an impressive indie title that wears its years of hard work for everyone to see. The title matures through each of its levels, giving it distinct character through its imperfections. Yes, it could be better, but it’s still pretty damn good.